Summary: Researchers have discovered a group of neurons in the retina that affect circadian rhythm by sending signals to the SCN. Researchers have found a new group of cells in the retina that directly affect the biological clock by sending signals to a region of the brain which regulates our daily (circadian) rhythms. This new understanding of how circadian rhythms are regulated through the eye could open up new therapeutic possibilities for restoring biological clocks in people who have jet lag through travelling or working night shifts. Biological clocks are synchronized to light-dark changes and are important to regulate patterns of body temperature, brain activity, hormone production and other physiological processes. Disruption of this can lead to health problems such as gastrointestinal and cardiovascular disorders, depression and an increased risk of cancer. The suprachiasmatic nucleus (SCN) is a region of the brain which co-ordinates the circadian rhythm using many different signalling molecules, including the neurohormone vasopressin. The retina signals environmental light changes to the SCN but it was previously unclear on how this process took place. This research shows for the first time that the retina has its own population of vasopressin-expressing cells which communicate directly to the SCN and are involved with regulating the circadian rhythm. This gives an insight into how the biological clock is regulated by light and could open up new therapeutic opportunities to help restore altered circadian rhythms through the eye. 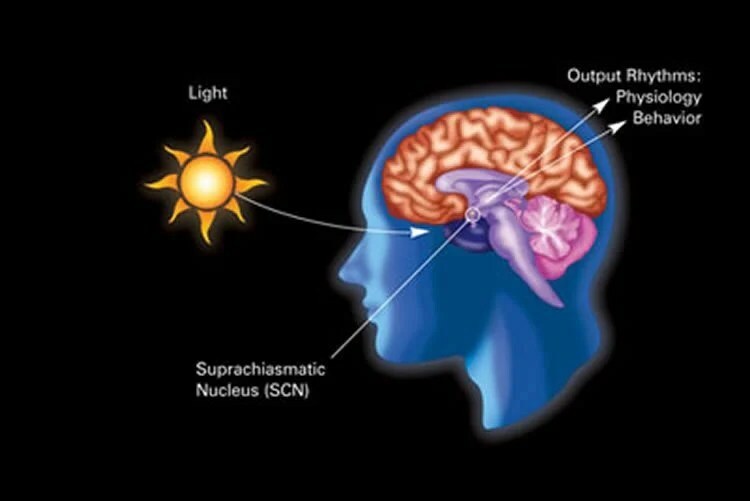 The suprachiasmatic nucleus (SCN) is a region of the brain which co-ordinates the circadian rhythm using many different signalling molecules, including the neurohormone vasopressin. NeuroscienceNews.com image is for illustrative purposes only. The researchers interfered with the signalling of light information sent to the SCN in rats. Using a series of physiological tests, they showed that vasopressin-expressing cells in the retina are directly involved in regulating circadian rhythms. The Psychological Society “Cells in the Retina Light the Way to Treating Jet Lag: Brain Views Immoral Acts As If They Are Impossible.” NeuroscienceNews. NeuroscienceNews, 18 April 2017. The Psychological Society “Cells in the Retina Light the Way to Treating Jet Lag: Brain Views Immoral Acts As If They Are Impossible.” http://neurosciencenews.com/jet-lag-retina-6439/ (accessed April 18, 2017). In all animals, the transition between night and day engages a host of physiological and behavioural rhythms. These rhythms depend not on the rods and cones of the retina, but on retinal ganglion cells (RGCs) that detect the ambient light level in the environment. These project to the suprachiasmatic nucleus (SCN) of the hypothalamus to entrain circadian rhythms that are generated within the SCN. The neuropeptide vasopressin has an important role in this entrainment. Many SCN neurons express vasopressin, and it has been assumed that the role of vasopressin in the SCN reflects the activity of these cells. Here we show that vasopressin is also expressed in many retinal cells that project to the SCN. Light-evoked vasopressin release contributes to the responses of SCN neurons to light, and enhances expression of the immediate early gene c-fos in the SCN, which is involved in photic entrainment of circadian rhythms.